Powers/Abilities: Piranha has exceedingly sharp teeth and claws, and has a sleeping venom which can be exuded from those claws. Piranha is exceedingly fast, able to keep up with the Sub-Mariner when swimming. Piranha regenerates from damage, though exceedingly slowly; it is unknown if second generation Piranha possess this ability. Piranha is also stronger than normal humans. 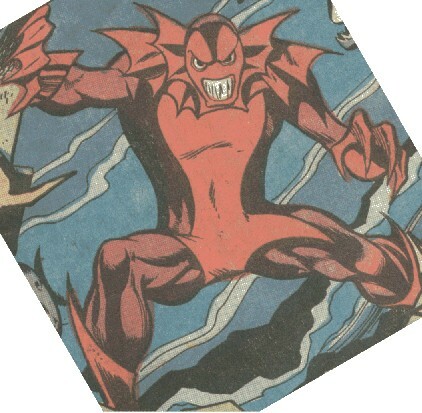 The original Piranha was able to go toe-to-toe with Namor, but the "second-generation" Piranhas were only able to over-power Namor with a 40:1 advantage, so the second generation seems much weaker, though still very powerful. Piranha can telepathically control fish and sharks, but it is unknown if he can control any other forms of life. His control is not unlimited, as he was unable to stop a school of blood-maddened piranha from devouring him. Where multiple Piranhas exist, they can communicate telepathically with each other. During his creation/evolution, Piranha absorbed intelligence by devouring Dr. Dorcas' assistants' remains. Piranha in an underwater creature--though he has appeared above water, he has done so only briefly, and it is not known if he can breathe out of water. When the original Piranha was eaten by a school of piranha, they eventually all evolved into duplicates of him. It is not yet known if these duplicate Piranha have this capability. (Marvel Team-Up#14 - BTS) - Dr. Lemuel Dorcas created what he called Aquanoids, or Men-Fish- "creations who are not merely marine-life or humanoid, but the perfect transmutation of both." The Sub-Mariner, with the help of Spider-Man, defeated these Men-Fish and blew up the lab in which they were created. (Savage Sub-Mariner#71 (fb)) - A normal piranha survived the explosion of Dorcas' lab, and was exposed to the remaining radiation from Dorcas' work. He evolved into the Piranha, and ordered other fish into the radiation as well, creating more Men-Fish. (All New Handbook of the Marvel Universe#8) - The Piranha's evolved intelligence unconsciously grew in part from his devouring of Dorcas' assitants. (All New Handbook of the Marvel Universe#8) - The Piranha moved to South America, where he used some of Dorcas' maachinery to try to evolve more piranha, but he succeeded in only slight changes, allowing them to survive in salt water and slightly improving their size and intelligence. (Savage Sub-Mariner#70 (BTS) / All New Handbook of the Marvel Universe#8) - Piranha moved his Men-Fish and piranhas to the Bikini Atoll, hoping the radiation there would further their evolution. (Savage Sub-Mariner#70 / All New Handbook of the Marvel Universe#8) - Piranha traveled to Hydrobase, hoping to research Dorcas' work there. When he learned Namor was traveling to Bikini Atoll, he quickly followed. (Savage Sub-Mariner#70) - Piranha and his school of Men-Fish attacked Namor in the Bikini Atoll, and Namor was unable to defeat them. (Savage Sub-Mariner#71) - Namor fled, leaving the Men-Fish behind, but Piranha was able to catch him. During his fight with Namor, Piranha inadvertently became trapped under some wreckage, and was wounded. His blood attracted his school of piranhas, and they turned on him and devoured him. (Marvel Two-in-One#28 (fb) ) - Over several months time, all the piranha who ate of the original Piranha evolved into identical Piranhas. (Marvel Two-in-One#28) - The Piranhas (now numbering in the hundreds), took up an amusing game--they would kidnap two people from ocean vessels and force them to fight, with the winner going free and the loser being eaten. The Sub-Mariner and the Thing were captured and subjected to this, with the Thing's girlfriend, Alicia Masters's life to be forfeited if they didn't fight. They did fight, but in doing so they destroyed the underwater stadium they were fighting in, crushing the Piranhas. (Defenders II#7) - The regenerated original Piranha joined with Attuma, Tiger Shark, Nagala, Orka, and Sea Urchin to defend Atlantis from the invading Prince Namor and the Defenders. The fight ended abruptly when the Defenders were teleported away. (Defenders II#11) - Again, the Piranha and Attuma's other allies defended Atlantis from the Defenders. Piranha fought the Valkyrie and was last seen unconscious on the battlefield. 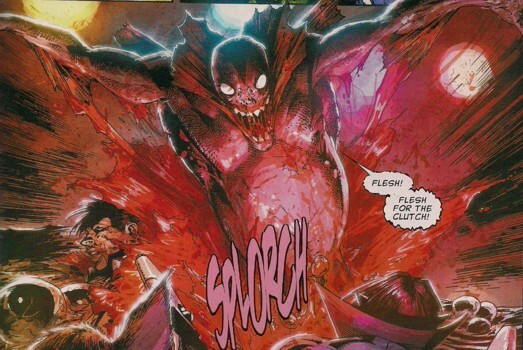 (Marvel Zombies 4#1) - Piranha and some of the Men-Fish were infected with a highly contagious zombie virus by Deadpool's head from Earth-2149. (Marvel Zombies 4#1) - After infecting the other Men-Fish Piranha led them to the cruising ship S.S. Tranquility. Though the Men-Fish and Piranha killed most travelers, Piranha also laid eggs into some of them to increase his army of zombie Men-Fish. Piranha was slain by the Midnight Sons, who found out that Piranha probably was female after all despite their information to the contrary. Comments: Piranha was originally created by Marv Wolfman, George Tuska, and Vince Colletta. On this page, "piranha" with a lower case 'p' refers to the fish, while "Piranha" with an upper-case 'P' refers to the evolved/mutated humanoid. The Sub-Mariner proclaims the Piranha's Men-Fish as "stronger, more powerful" than Dorcas' Men-Fish, even though Piranha pretty much sat back and let the radiation do its work. As Dorcas used more than just radiation in making his Men-Fish (for example, he attempted to drain the Sub-Mariner's "life-force and vitality" into his Men-Fish), some of the chemicals and other involved elements clearly also leaked into the sea water, helping the process. When the Thing and the Sub-Mariner destroyed the arena, it seems unlikely in the extreme that the Sub-Mariner (carrying Alicia Masters) and the Thing were both able to escape while none of the hundreds of Piranha did. Presumably, several survived. The Piranha gets around! The original Piranha was created in the Atlantic, not far from New York City. He collected and mutated Piranha in Brazil (South Atlantic), then moved them to the Bikini Atoll (South Pacific). He observed Namor at Hydrobase, and followed Namor back to the Bikini Atoll. His next meeting with Namor was in the North Atlantic. Finally, piranha are not salt water creatures. The original piranha who was mutated had to have been brought there by Dr. Dorcas, and the school of piranha in the south seas had to have been somehow mutated by the Piranha himself. Since he has not produced more Men-Fish since the initial batch, one could hypothesize that over time the radiation from the ruined experiment has died off and no more Men-Fish can be made. The All New Official Handbook of the Marvel Universe #8 notes that the Piranha hauled the radioactive equipment away to a South American fresh-water river in hopes of making Men-Fish from piranhas, but succeeded only in creating the relatively piranha who were capable of surviving in salt water. Marvel Two-In-One#28 calls the piranhas "men-fish", failing (unfortunately) to make the proper distinction between the piranhas and the Men-Fish (seen in Marvel Team-Up I#14), as noted in the profile. Marvel Two-In-One#28's text would seem to be metaphoric, as only the piranhas make an appearance in that issue. The Men-Fish have a one page profile (not very informative) as one of "Spider-Man's Forgotten Foes!" in Web of Spider-Man Annual#3. Could Piranha have been mutated to his humanoid form by Dr. Dorcas using some of Todd Arliss' DNA? That would certainly explain his ability to psionically control sharks, the way Orka of Atlantis controls killer whales! or to any other similar beings or anyone else with a similar name . The Men-Fish are man-sized humanoid fish, and are very strong. They apparently don't speak, and they serve the Piranha. They use tactics in fighting, but it is unknown if this is a result of their own intelligence, or of Piranha's control. When last seen, most were alive and well off the Bikini Atoll. Some Men-Fish were infected with a zombie-virus by "Headpool". Piranha and the zombified Men-Fish infected the other Men-Fish with the zombie virus and they were ultimately slain by the Midnight Sons on the S.S. Tranquility. A few escaped, but their boat was blown up by the Midnight Sons before they could reach the island Taino.